We all have our favourite gaming series we love to return to whether it’s a popular choice like Mario Kart or perhaps something a little more niche like the Project Zero games. And while I’m never one to say no to a quick race or twenty in Mario Kart 8 Deluxe, there are other potentially lesser-known franchises where my passion burns just as bright, Out Run being one of them. Lucky for me then that SEGA’s next choice for its SEGA AGES line-up is the brilliant 1986 arcade racer. If you’ve ever crossed paths with any form of arcade racer then you should feel right at home with Out Run, the game all about making it to the finish before time expires. What sets this series apart though is in its use of branching routes. You see in Out Run you’re not simply completing laps of a circuit nor following a linear A to B route. Instead, your journey will consist of five stages, the roads between each forking in two directions essentially offering the player the chance to choose where they head to next. This isn’t just a case of differing road layouts either, each of the fifteen potential stages being set in a unique and varied environment. So while everyone’s road trip will always start at the sunny Coconut Beach, their final stop could be in one of five possible locations. It’s a great hook and one that encourages you to explore every possible route in the hopes of attaining the best time and score. Controls are nice and simple with your car responding to your inputs with fairly snappy precision. As stages grow in complexity, not to mention the traffic a constant consideration, you’ll need your wits about you if you’re to make it to the next checkpoint in time and avoid being sent spinning out of control. In fact, Out Run is a pretty tough game by today’s standards, the balance between speed and manoeuvrability somewhat of a difficult beast to tame. It’s very easy to lose focus and find yourself careening through the air following an unwanted face to face with a billboard at the side of the road. The game is tough sure but never feels unfairly so. Mastering a stage and getting yourself one step closer to the finish line is a rewarding feeling and something many modern racers can’t quite seem to replicate. At its core this version of Out Run plays and feels as good as it ever has, but what exactly are some of the newer features? Perhaps the biggest are the gameplay modifiers, awarded for reaching the game’s five different finish lines. These include upping the top speed to 350 km/h, reducing the punishment for crashing and even allowing you to go off-roading without losing much speed. They might seem like small tweaks on the surface but for longterm fans like myself will offer a chance to try out this beloved classic in brand new ways. Even better is the fact you get the chance to race in other colours besides the usual red. Online leaderboards are included, each of the five finish lines getting their own list to compete in. The game even saves videos of your best runs and gives you the opportunity to view anyone else’s online too. These additions alone make Out Run far more replayable since now you’re competing with the rest of the world as opposed to just a handful of preset computer-based scores. In keeping with previous releases in the SEGA AGES series, you can expect the same level of customisation – be it in visuals, audio or even gameplay. So whether you want to adjust things to create more of a challenge for yourself, add scan lines to give your experience a more retro feel or even see the action in full widescreen then this version of Out Run has you covered. Likewise, controls go beyond just your traditional affair even including a motion option, a feature perhaps better served when playing in docked mode. Any fan of the series will tell you that a huge part of any Out Run title is the music and M2 do not disappoint here. With this version not only are you getting the songs that were included in the arcade original but also those added to the 3DS update plus a handful of brand new tunes, too. All fit the vibe of the game perfectly and compliment the fast-paced action as you speed through an assortment of vibrant environments. 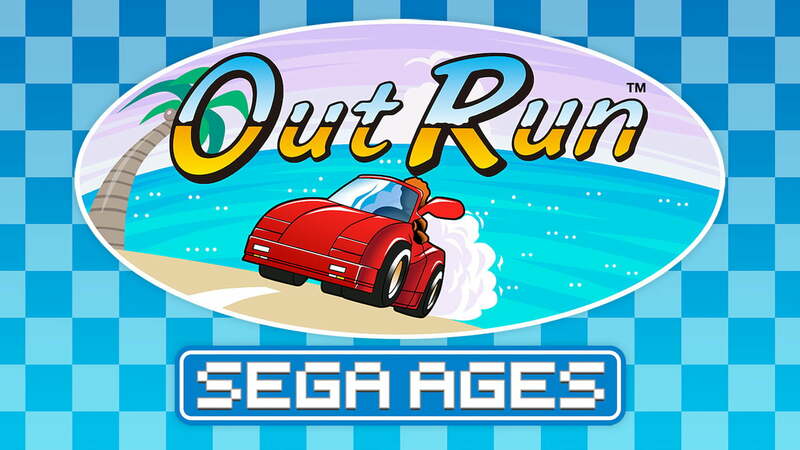 Out Run is a true classic pure and simple and a fantastic addition to the SEGA AGES line-up. It’s one of those games you’ll find yourself pulled back to for one more joyride and with its numerous options, extra features and choice between playing portable or on the big screen the Switch version is arguably the best version out there.